*Sold* This original, handmade 100% real pressed flower and foliage all-occasion card is one-of-a-kind and makes an everlasting keepsake or special gift. 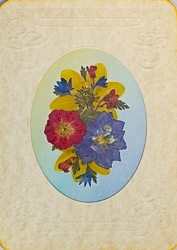 Comes on parchment card stock with embossed accents and flowers are covered for protection. Card has rounded corners and is approx. 4 1/2" by 6 1/4" with matching parchment envelope. One-of-a-kind, what you see is what you get. Blank inside so the recipient can write their own special message. In addition, the card comes with a translucent blank panel insert in case the purchaser wants to write a special message to recipient while keeping the card's inside blank - thereby preserving it for future use. Includes separate information slip about what flowers are included and what makes this card so special.